We can custom mill from any specie. We can offer the option of wide widths and lengths in over 50 different domestic & exotic lumber species. Custom sizes available up to 8″ wide. We are direct exporters of exotic hardwood flooring and Eco-Friendly, sustainably harvested hardwood lumber products. Since its inception, Advantage Florestal has been a leading advocate of sustainability. We are devoted to protecting the forests and offering our customers sustainably sourced and harvested, eco-friendly wood flooring, decking, deck tiles and more. Many of our products are FSC® certified and they meet the highest environmental and quality standards. We are able to offer excellent pricing on hardwood flooring since many of our mills that manufacture our Ipe decking also produce flooring. Our large volume of decking imports allows us to overlap our buying power on exotic flooring. We can also produce custom dimension flooring in a variety of sizes and in over 55 different species in our US mill. To view more of the species that we can produce custom flooring from visit the hardwood lumber section of our website Advantage Lumber Hardwood Selection. This will give you an overview of some of the species we can custom mill. Please Call Us +1(941)388-9299 for a custom quote. Staybull Flooring™ is recycled flooring with exclusive advantages that make it one of the most durable and beautiful eco-friendly flooring options. Staybull Flooring™ flooring saves on waste that other flooring companies leave behind. This means you get an Eco-Friendly Flooring product that is not only good for you but also is an excellent choice for our environment. Staybull Flooring™ greatly reduces cupping associated with standard wide plank flooring installed over a plywood subfloor. This means that you can install Staybull Flooring™over a plywood subfloor and have the confidence that your floor will NOT cup like typical wide plank flooring can do. Now you can have the look of a wide plank without the cupping problems, yet still maintain a solid floor that can be sanded and refinished after many years of use. When you purchase a Staybull Floor you are not just buying a floor, you are buying a piece of mind. Staybull Flooring™ can also be installed over aged concrete slabs. This is a major benefit to people looking for a solid floor who don’t like the thin layer of wood on top of typical engineered flooring. **Note that installation over fresh slabs could lead to problems with any wood flooring due to the high moisture content of newly poured concrete slabs. Increased Stability– Resists cupping & twisting which often occurs in traditional solid wide plank flooring. This added stability is a result of gluing multiple narrow pieces of wood together, eliminating the tension normally found in wide, solid pieces of lumber. Designer Look – Unique “one of a kind” beauty. Expanded Installation Options – Staybull Flooring™ is an innovative hardwood flooring product that can be either nailed to a traditional wood subfloor or, in most cases, can be glued to an aged concrete slab. Long Lasting Beauty – Unlike engineered flooring which has just a thin “wear” layer Staybull Flooring™ can be sanded & refinished, if needed, after many years of use. Economical Options– Many hardwood species that we offer are very affordable flooring options. Long lengths – Our advanced manufacturing process yields a much longer average length than the flooring industry standard. With Staybull Flooring™ you do not have to deal with the abundance of 1 to 2-foot pieces that are commonly shipped with traditional flooring. Truly Green – Some “environmentally friendly” flooring is not what it appears to be. A large percentage of bamboo flooring is manufactured with formaldehyde glues which can emit toxins throughout your home. 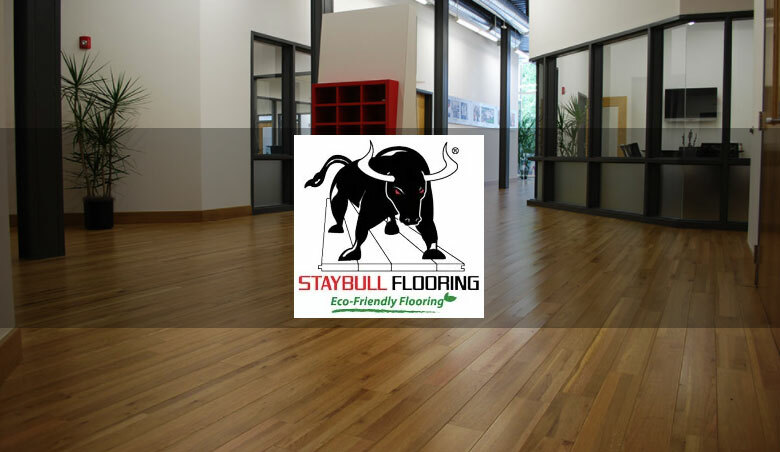 Staybull Flooring™ is free of any harmful glues or finishes. We manufacture our custom flooring in our Buffalo, NY facility with the finest European equipment. This End Matcher pictured above allows us to produce long custom flooring up to 20′ long. Most manufacturers can only produce 8′ long. We produced this Santos Mahogany flooring with lengths up to 12′ long as requested by a customer. Long lengths add to the beauty of a floor and also speed installation time. Our unfinished Tongue & Groove flooring is kiln dried to 6 to 8% moisture content. Milled to excellent tolerance for a fast & easy fit. Clear Grade is mostly uniform in appearance, has a limited number of character marks, and is mostly heartwood. Select Grade is clear of knots but has more color variation than clear grade. Natural/Common Grade flooring will have some color variation, mineral coloring and small pin knots. Rustic Grade flooring will have larger tight knots and the most color variation. Micro-bevel on all 4 sides. Multi-coat, U.V. & scratch resistant finish. Sorted for a more consistent color. Kiln dried to a moisture content of 6 to 8%. Select & Better Grade Sold in 21 square foot boxes.